In violist Nadia Sirota's deeply engrossing new album "Baroque," pulsating digital tracks swoop around the hip, young musician’s solo lines to create lush electronic soundscapes. String ensembles grind out driving ostinati reminiscent of Led Zeppelin and Jimi Hendrix. And Sirota’s feral yet feeling tone is more reminiscent of the raw vocal stylings of Jim Morrison and Patti Smith than the pyrotechnic perfection that is associated with the sound of castrati like Carestini and Farinelli. Yet upon closer inspection, the music on Sirota’s album subtly references the period in Western art music when male opera stars sang higher notes than their female counterparts and melodies babbled with ornamental Tourette’s. Though Bach, Handel and Scarlatti are absent from Sirota’s set list, their ghosts lurk in the wings. Just as 17th and early 18th-century composers frequently wrote works for specific performers, so the authors behind the six tracks on the recording — Nico Muhly, Daníel Bjarnason, Paul Corley, Judd Greenstein, Shara Worden and Missy Mazzoli — compose with Sirota’s charismatic, genre-defying musical approach in mind. The individual pieces might be thought of as contrasting movements in a Baroque suite. The rippling, arpeggio-laced keyboard accompaniment in Worden’s From the Invisible to the Visible possesses a gigue-like quality, while Sleep Variations by Bjarnason has the feel of a stately sarabande. From the elaborate ornamentation of Mazzoli’s Tooth and Nail, to Greenstein’s In Teaching Others We Teach Ourselves, which pits a euphoric solo melody against an undulating string accompaniment solo concerto-style, to Muhly’s jaunty Étude 3, with its ground bass-like accompanying motif, the works on the recording all pay homage in some small way to the Baroque era. Even Corley’s Tristan de Cunha, featuring a decidedly contemporary-sounding, static-infused electronic accompaniment, obliquely recalls the period: The piece is named after a remote volcanic archipelago in the south Atlantic ocean which was first peopled in 1643. 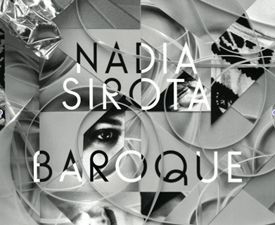 The injection of the spirit of the 17th and 18th centuries into a recording that is otherwise entrenched in the 21st century is what makes Sirota’s "Baroque" sound otherworldly, bold and new.